Solar heating is the most economical option to heat both, indoor and outdoor pools. It´s very practical as far as outdoor pools is concerned, since increasing the water temperature by just a few degrees, significantly lengthens the time that it can be used. 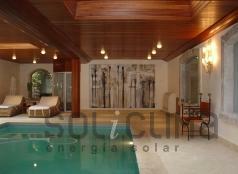 Installing solar panels to heat the pool is a simple, economical and ecological way to do it. The benefit that it provides and the better comfort, do not come at the expense of increasing the energy consumption nor the emissions of greenhouse effect gases. To enjoy your indoors pool, you will need heating and dehumidifying, then heat produces damp, that condenses in the walls, glass and forniture. A heat pump allows to generate more heat than the consumed energy, then it extracts energy from entorn. Heat pumps specially manufacturated for swimming pools generate 6 more energy than that one consumed. They are really high performance devices. It is possible to use a conventional boiler to heat an indoors pool, but since it is essential to apply a heat pump to dehumidify, it is recommended to use a heat pump for the whole process, then heat pumps are much more efficient than boilers. Heat pumps are the most efficient heating system to find. It doesn't consum heat to generate heat or cold, but to desplace heat from a place to another, using some physical laws. Fridges, for example, are heat pumps, so are air conditionning devices. The convert liquid inside hydraulic circuit into gas; gas is located there where there is the heat we need; a compressor -the device inside the heat pumpt which consums electricity-, press the gas, with a double effect. On one hand, by compressing, gas becomes liquid again. This change of state produces heat, the heat we need. Solar energy can be applied as auxiliar system of pump heat, so energy efficiency of the installation would be optimal. An indoors swimming pool, no matter if its big or small, produces damp, that condenses on glass and walls. To avoid condensation problems, is necessary to dehumidify. An easy dehumidification equipment can keep the air and water pool warm avoiding condensation simultaneously. In the case of outdoors swimming pools, we use polipropylen collectors. They are very simple models, just a monopiece of black plastic crossed by the pool water, and pumped with the same hydraulic pump of the pool. Its installation is also very simple, and with small money we can enlargern our bath season outside summer months. If it handles on indoor pools, we can use heat pumps, that are high efficiency systems, much more than boilers. Heat pumps doesnt generate cold or heat by means of the electricity the use; the use the electricity to move heat from a place to another one. They usually take or remove heat to outside. That is why heat pumps are much more effective than heat pumps. To avoid condensation on floor and walls on an indoor swimming pool, is required to install air dehumidifiers that are integrated, as we can see in the pictures.